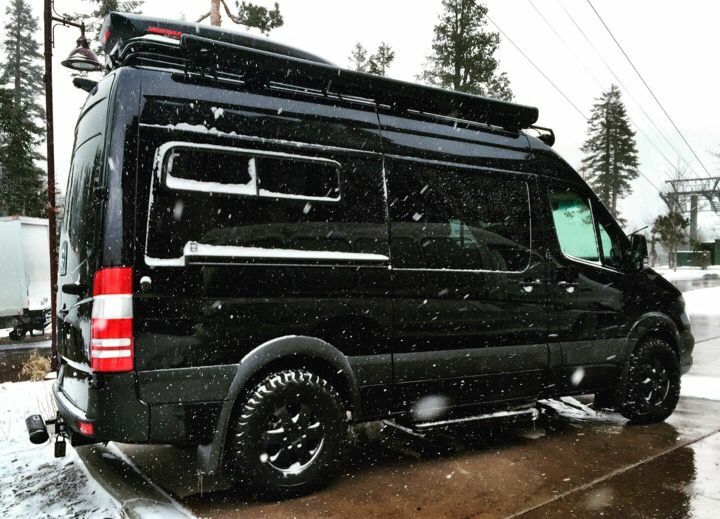 Has anyone here installed or seen the Flarespace pods on a 144 Sprinter? I've 5'10 so these look to give us a bit more space to sleep across the van but most of the photos I've seen are of the 170 installs. Anyone have experience or have considered them? Yes, we are installing them in our 144" build. More Flarespace info here. Width in transverse bed space is 76". Gallery (15 pics) of Flarespace pods on two different 144" Sprinters (good close ups) here. Scroll down after page loads. 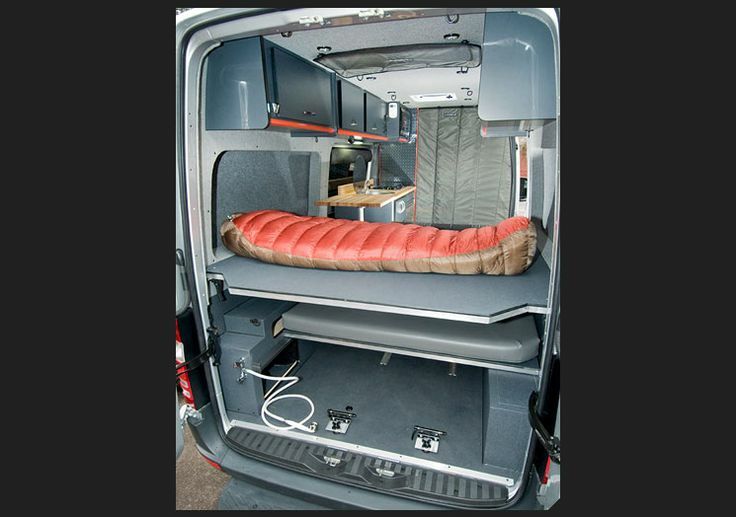 This dealer claims 78" transverse bed is possible. Notice from pics that Flarespace does not impede sliding door on 144" Sprinter. Anyhow, they have two options: A shallow & deep. A pair of shallow flares will allow a 6' sleeper to be comfortable. Due to interference with the sliding door, the deeper flare can only be installed on the driver side. Sonja mentioned that only folks 6'2 & above go for the deep option (doesn't sell many). A window can be fitted to either side or both. However, the window trim consumes about an 1" of interior space ... 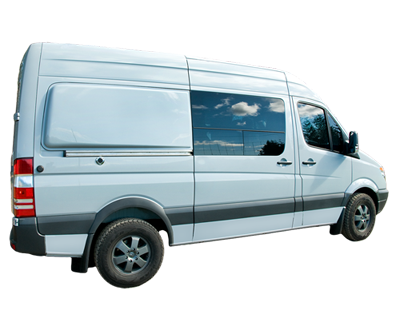 Install labor on a passenger van will be higher as the factory window adhesive has to be removed very carefully to prevent damage/bending of the sheetmetal. Paint is by a 3rd party (a body shop of your selection). VtSoundman, Thanks for this! That is great information to have. This means that if you want pods on both sides, the 172" wb Sprinter could take two deep ones, but a 144" wb would need to be either two shallow, or a deep one on the driver's side and a shallow one on the passenger's side. I will inform Brian that I'd like to do one of each on my build. Love this forum! Thanks again for the great info. A pair of shallow flares will allow a 6' sleeper to be comfortable. Thanks for the responses. I would guess winter insulation adds a bit as well? We were looking at a very similar floor plan to TomH's, but were look to fit a inside shower in the 144. It can be done. If you shorten that lower bed on the driver's side a hair, you can turn the toilet compartment sideways and make it a wet bath (see my illustrations at the beginning of my build thread). You might even be able to turn my latest configuration into a wet bath. You could leave that bed as is, remove our big refrigerator, turn the wet bath inline with the van, and put a small fridge under the kitchen counter on the other side. You could also put a wider bed in the Flarespace section, eliminate the lower bed, keep the big fridge, and rotate the wet bath. The thing about an inside shower in a 144" is how much clean water and grey water you want to put on the rig. If you want a sponge bath, you're fine. If you want a long shower, you need a D5 heater tapped from the diesel (very expensive-though I'm getting one) and either a large fresh water tank or connection to water in a campground) as well as a large grey tank. I want to have a large lithium battery bank to run AC a lot and need an auxiliary fuel tank to run the 2nd alternator. I also want enough fresh water for extended remote boondocking. This will take up a lot of my underfloor space. I don't need a shower every day, but when I do shower, I want a long hot one. This means daily sponge wipe downs at the sink and occasional showers at a campground shower or motel room fit the bill for us. We also will put the external shower at the rear door so we can shower there when in the backcountry. 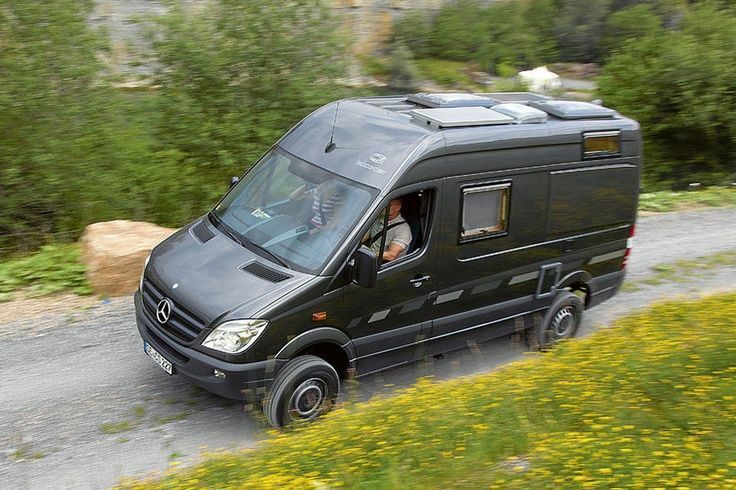 I have seen people open the rear doors, put a stabilizing rod between the open doors, drape a homemade curtain/tent over the top and down the rear (at end of doors) to have a roomy outside, mostly private, shower, but this is for remote camping. There are also other alternatives. One person has a shower pan in a large bottom drawer. You pull it out and stick an adapter in the floor and the ceiling has velcro points for a curtain that turns the center of the van floorspace into a temporary shower. Other people have a portable pan they lay down and do the same with the velcro curtain. There are pics in the archives of some people's photo galleries. I have some screen captures if you don't find those. The SMB site has an online DIY design center where you can play around with designing your own floorpan. You can save as many plans as you want to after creating them. It doesn't tell you in the instructions, but if you hold shift with one hand and click the cursor on the corner of a bed, cabinet, etc. you can drag and resize the item to suit your preference. I recommend that you start a build thread and that we copy this into it. 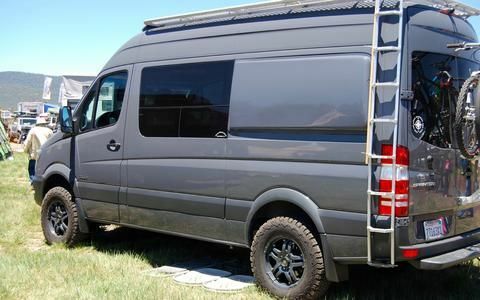 (Or maybe the moderators could alter the title of this thread to 144" Sprinter Build with Flarespace Pods for you and it becomes your build thread.) Then you can ask questions and get feedback from lots of smart people. This site has been an unbelievable resource for me. I've been getting and refining ideas here for years. You will find that people really enjoy helping each other figure out how to do what they want to accomplish. I hope you will go ahead and start that build thread and GOOD LUCK!! 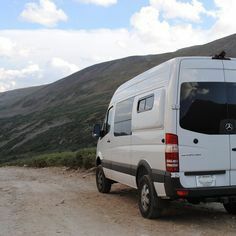 We've got the smaller 24x33 bathroom/shower stall in our older T1N 140 wheelbase Sprinter, which is even tighter than the current NCV3 models. It's definitely usable and we just lift out the Porta-Potti for showering. As TomH notes it's definitely not going to supply long, luxurious showers, mostly due to fresh water supply limits when remote camping. If we're anywhere near a town, commercial campground, or national park concessionaire with showers it's easier to just go there. But when you're many miles over rough dirt roads from the nearest facilities, covered with sunscreen, sweat, and bug spray from a long day of hiking or riding, even that little 2-3 gallon shower feels pretty luxurious! We are pretty early in our research, but 144 is about the biggest we can fit in our driveway, hence why I am asking about Flarespace pods. What size water tanks can fit on the 144? I've seen the showers sizes, but haven't found the water tank capacity. Our two use cases are post bike rides and post back country skiing in the winter (diesel heating required). After 13 years of parking lot solar showers (a 5 gal solar solar lasts us 2 days currently as reference), a little more privacy showering at trail heads along with heating and indoors for cooler activities are really a big part of why we are thinking of a sprinter.